Abu Ishaq Ibrahim ibn Muhammad al-Farisi al Istakhri (aka Estakhri, Persian: استخری‎‎, i.e. from the Iranian city of Estakhr, b. - d. 957 AD [346AH]) was a Persian medieval geographer in medieval Islam and traveler of the 10th century. 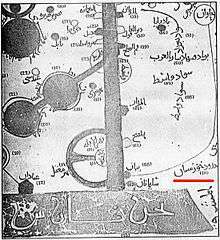 Estakhri created the earliest known account of windmills. 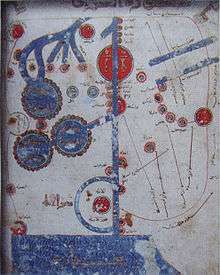 His Arabic language works included masalik al-mamalik (مسالك الممالك, "Traditions of Countries") and Suwar al-Aqaaleem ( صور الاقاليم, "Shapes of the Climes"). He was a traveller whose geographical work has been translated into German by Mordtmann. When Istakhari was in the Indus Valley he met another celebrated traveller, Ibn Haukul. ↑ Mojtahed-Zadeh, Pirous. "The Persian Gulf in the Geographical Views of the Ancient World" In Cartographie Historique du Golfe Persique. Edited by M. Taleghani, D. Silva Couto, & J.-L. Bacque-Grammont. Louvain, Belgium: Diffusion, 2006. 17.